A new, vertical-spindle machining centre has been introduced by the German manufacturer, Spinner, which despite having a generous working envelope of 1,650 x 820 x 820 mm, occupies a relatively small footprint on the shop floor of 3,550 x 2,750 mm. Its compactness is a result of employing a novel method for protecting the 1,800 x 820 mm table’s X and Y axis guideways from swarf and coolant ingress using a single wiper system and without recourse to telescopic covers. Another notable characteristic is the 14.5 tonne, FEM-optimised cast structure, which provides a high level of rigidity and vibration damping for elevated cutting performance and high standards of surface finish on machined components. Further advantages are that tool life is extended and accuracy of machining is enhanced, assisted by optimal chip evacuation via a conveyor at the front of the machine which ensures negligible transmission of heat. The distance from the operator to the front of the table, which accepts components weighing up to two tonnes, has been minimised to 200 mm for convenient workpiece loading and unloading without strain. Operator convenience is extended further by the ability to adjust the control panel height and keyboard angle. The machine is nimble despite its size, with rapid linear traverse in X, Y and Z of 48 m/min. Options available on the machine are a 32 or 60 tool magazine; a choice of Siemens 840D SolutionLine, Heidenhain TNC620 / TNC640 or Fanuc 32iMB controls; and an SK40, SK50 or HSK63 spindle with speeds from 8,000 to 18,000 rpm and power / torque up to 62 kW / 343 Nm. 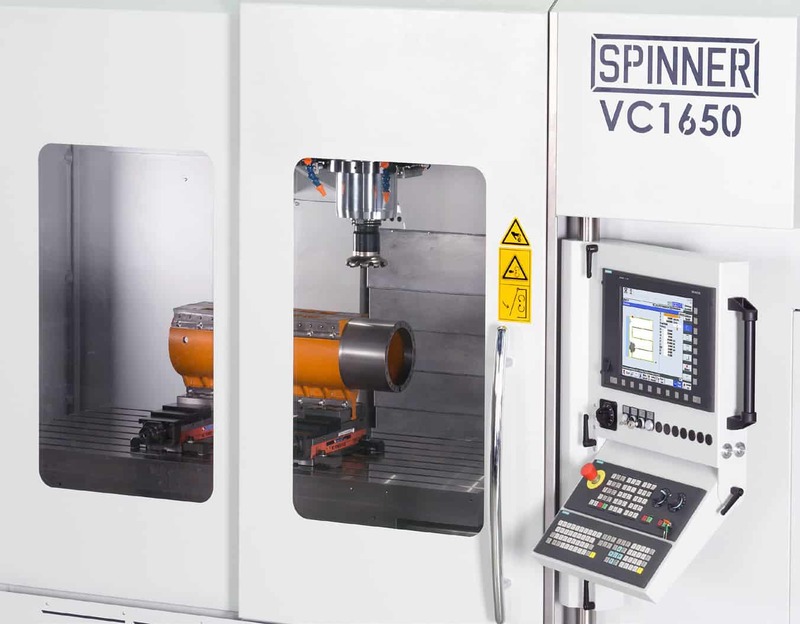 There are numerous other opportunities to customise the Spinner VC1650. Further equipment that can be supplied include a rotary table, coolant mist suction unit, high pressure coolant delivery (22 or 70 bar), hydraulic workpiece clamping, workpiece and tool measurement, glass scales and various tooling packages.